For this year’s Orchid Show, we’ve gathered stories about the most famous orchid of them all: the genus Vanilla. (Yes, vanilla is an orchid.) One unusual story comes from Ph.D. student Lynnaun Johnson, whose work in our doctoral program in Plant Biology and Conservation took him to Mexico, the native land of edible vanilla. Last April, I ventured to Mexico as part of an international team investigating how cultivation practices influence the growth and health of the orchid Vanilla planifolia. 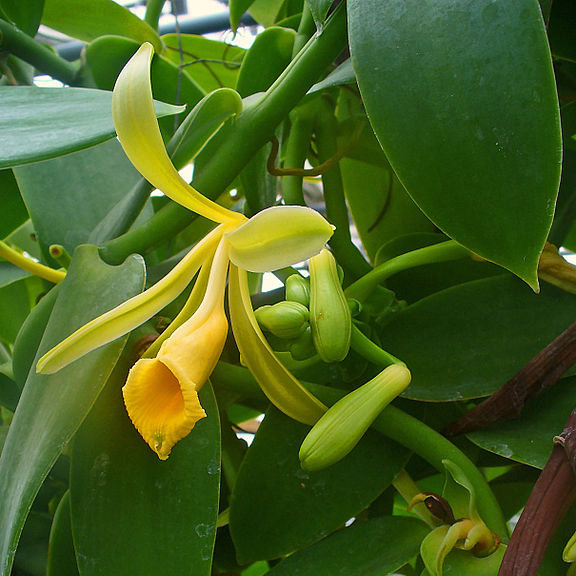 Vanilla planifolia produces the seedpods used to make vanilla, the spice used for flavoring desserts and beverages, and for providing wonderful aromas in candles, perfumes, and many other things. This collection trip would take me to vanilla’s native habitat of Mexico. All varieties of vanilla originated in Mexico, including those of Madagascar and Tahiti. Each of the plantations had different soil texture. At the last organic farm, the soil was compact and hard. At the farms that were in the forest, the soil appeared rich and softer. There is no way to quantify the terrestrial root growth, but I did note that the roots in the organic farms were longer and healthier, with some growing up to 4 or 5 feet when we dug the roots up from the soil. At the Pantapec farm in the state of Puebla, Mexico, vanilla is cultivated in a highly managed environment. 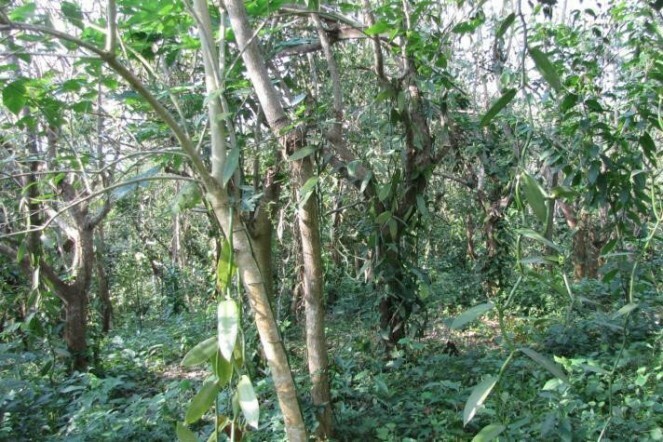 By contrast, the vanilla grown at 1 de Mayo farm in the state of Veracruz, Mexico, is cultivated in a completely natural environment. My part of the research project is to collect root samples from V. planifolia from each of these different farms to study the fungi and bacteria inhabiting this orchid. 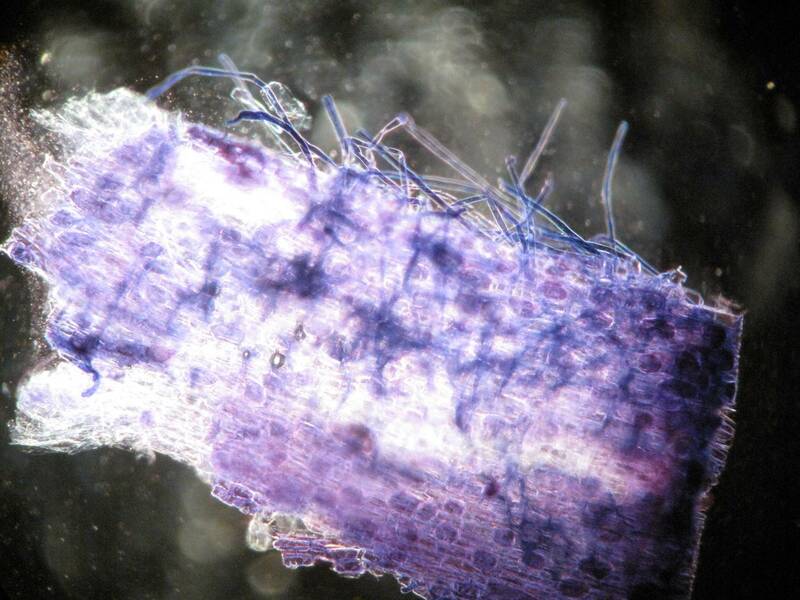 Currently, not much is known about the microbes (fungi and bacteria) that reside in orchid roots. Some fungi and bacteria can cause diseases. For example, with the appearance of a fungal pathogen such as Fusarium oxysporum, Mexican farmers can lose 67 percent of their crops when the Fusarium causes the rotting of the Vanilla’s stem and roots. On the other hand, there are beneficial fungi that inhabit roots, known as mycorrhizal fungi. These beneficial symbiotic fungi acquire mineral nutrients for the Vanilla, and sometimes receive carbon from the orchid in exchange. Although 90 percent of plant species have mycorrhizal fungi, and while we have a good understanding of mycorrhizal fungi of some of these relationships, relatively little is known about the mycorrhizal fungi of orchids, including V. planifolia. The reason for this is that isolating and growing the fungi and bacteria associated with orchid roots can be difficult, and some have never been grown outside of their host. At each farm, I wanted to sample five individual plants of V. planifolia. Additionally, because of the lifestyle of this orchid, I also wanted to sample the above-ground roots (epiphytic) and the below-ground (terrestrial) roots in the soil. Using either a scissors or a scalpel, I cut small root samples and placed them into Ziploc bags. 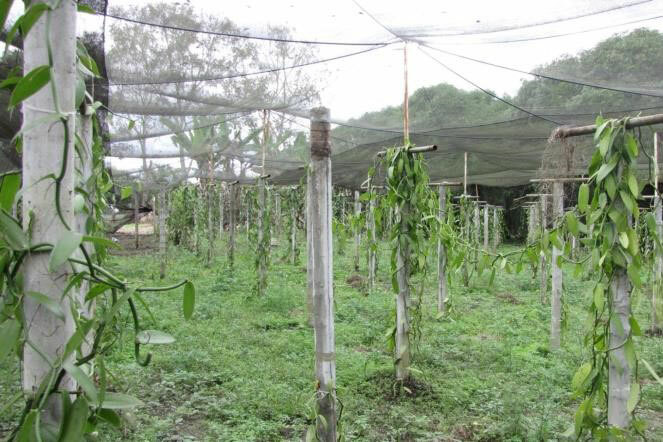 The vanilla plants are very precious to the farmers, and so a few were initially uncomfortable with our cutting off pieces, but ultimately they were very accommodating. 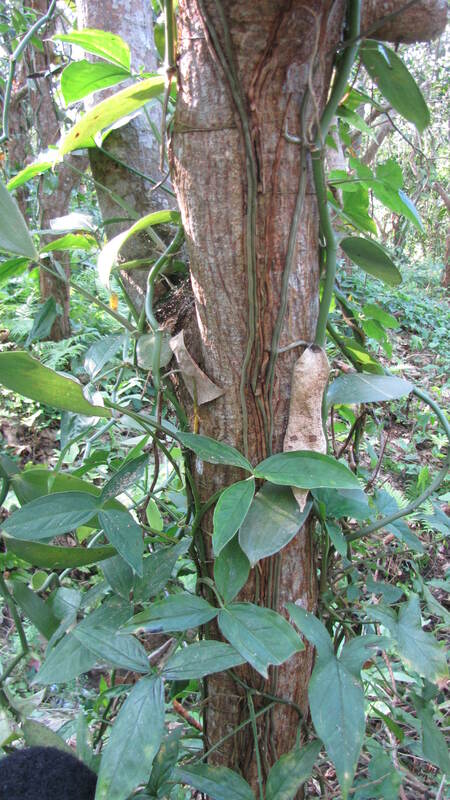 Typically, vanilla grows as a vine, with two types of roots: epiphytic roots (those that wrap around trees or other structures) and terrestrial (soil) roots. This is referred to as hemiepiphytic, because it starts in the ground and grows upward onto the tree’s bark. Many research papers suggest that epiphytic roots do not harbor many fungi, because these roots can photosynthesize, and do not need mutualistic fungus partners. Back here at the Chicago Botanic Garden, I am in the process of evaluating the microbial community that lives in the root samples I collected. We are using a new technique called high-throughput sequencing that will enable me to evaluate the entire fungal and bacterial community within the orchid’s roots by using their DNA as a way to fingerprint the individual species of microbes. We are not certain how many species of fungi and bacteria we will find, but we predict that this method will give us a good picture of the fungal and bacterial community in these roots and if these communities differ among the different farming techniques. These data will be used to better understand how epiphytic orchids utilize mycorrhizal fungi and refine the best conditions to grow vanilla and prevent diseases in the plants. This research trip was a delight, not only because of the samples that I collected, but also because I could learn more about how vanilla is grown and used. The farmers showed us how they cure and prepare the vanilla by fermenting it in the sun and before drying it thoroughly. I also tasted homemade “vanilla moonshine,” generously offered by the farmer’s wife. When visiting Papantla, I learned about the Aztec myth that explained how forbidden love created the sacred vanilla orchid. And of course, I was elated because I usually spend the majority of my research time in the lab. And here I was in the tropics, after spending the previous months facing the bitter Chicago 2014 winter.